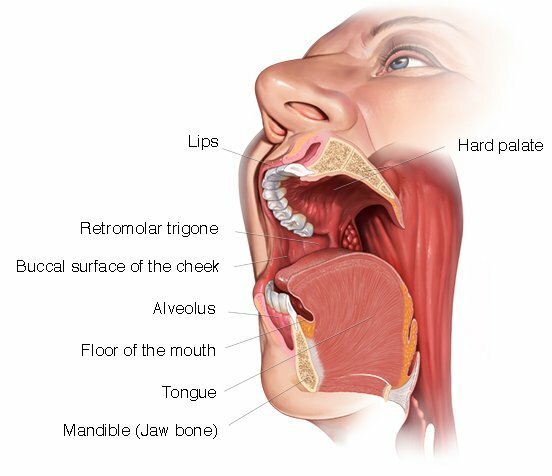 The most common type of oral cavity cancer is squamous cell carcinoma, other cancers such salivary gland cancers and sarcomas are far less common. In this section I will be discussing the management of early (stage I and II) disease (more about Cancer Staging here). If you have a locally advanced (stage III or IV), metastatic or recurrent cancer more information can be found here. 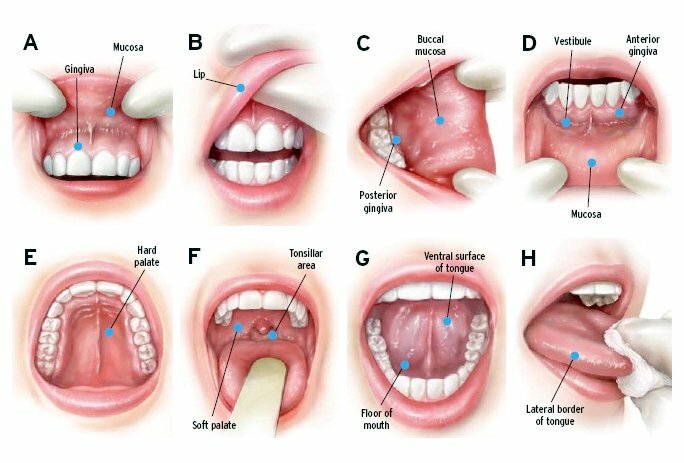 The oral cavity extends from the skin-vermilion junction of the lips to the junction of the hard and soft palate above, and to the line of circumvallate papilla or taste buds of the tongue below. The anterior tonsillar pillars and glossotonsillar folds serve as the lateral boundaries between the oral cavity and oropharynx. Rarely, an oral cavity cancer can originate from within the mandible (eg, osteosarcoma). Other types of jaw tumours (odontogenic lesions), including the vast majority of ameloblastomas, do not metastasize or involve lymph nodes, although they may be locally destructive. Immunodeficiency – e.g. HIV infection or drug induced immunosuppression after an organ transplant. It is therefore important to reduce these risk factors to a minimum, coupled with a balanced diet and healthy lifestyle in order to reduce the risk of developing cancer. Moore S, Johnson N, Pierce A, Wilson D. The epidemiology of lip cancer: a review of global incidence and aetiology. Oral Dis 1999; 5:185. King GN, Healy CM, Glover MT, et al. Increased prevalence of dysplastic and malignant lip lesions in renal-transplant recipients. N Engl J Med 1995; 332:1052. Warnakulasuriya S. Global epidemiology of oral and oropharyngeal cancer. Oral Oncol 2009; 45:309.